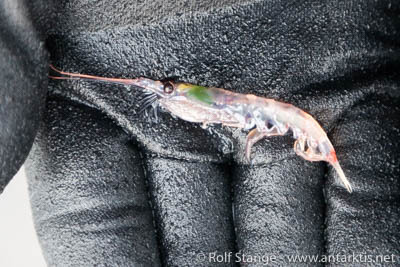 News from Antarctic science: What's the age of Krill? Home → * Antarctic News → What’s the age of Krill? What’s the age of Krill? Australian researchers report in the journal PLOS ONE, that they were able to determine the exact age of Krill for the first time. As known from lobsters and crabs, the age of Antarctic krill can now also be determined by the bright and dark rings of their eye stalks. So far, krill that were older than two years could not longer be determined by their size, since environmental conditions and food supply were responsible for their growth or even shrinking. If it is possible to determine the age groups of swarms of krill the CCAMLR (Convention for the Conservation of Antarctic Marine Living) would be able to determine catch limits more precicely. Since the scientists can use the same method to age determine krill in scientific collections and museums, they soon will be able to compare the age composition of past and present krill swarms. Samples of the study yielded ages between one and five years, but the main point of the study was to establish the technique and not to actually describe the age of krill.